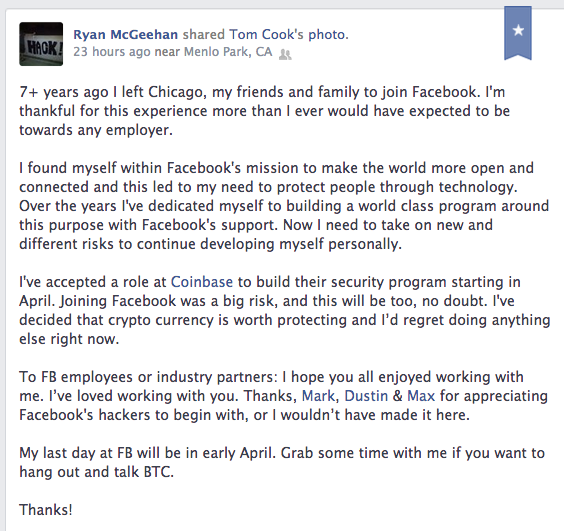 Ryan McGeehan has recently announced on Facebook, fittingly, that he is leaving his role at Facebook as its Director of Security Incident Response, and taking up a security-related role at Coinbase. Another senior Amazon director, Todd Edebohls, is also joining the company as its new vice president of business development. After the world’s former leading Bitcoin exchange Mt. Gox filed for bankruptcy, the entire Bitcoin ecosystem has entered yet another period of doubt and uncertainty. Mt. Gox, which posted roughly $400 million in losses, instigated new concerns that companies built around the crypto-currency aren’t trustworthy. So, Coinbase, one of the leading venture-backed Bitcoin startups, is under a lot of pressure to prove that it can do right where other independent, bootstrapped companies have failed. If consumers perceive Bitcoin as unsafe, Coinbase’s future is put in doubt. So bringing someone with the track record of McGeehan might placate both users and investors alike. Coinbase co-founder Fred Ehrsam said the company continues to use a cold storage system with multiple distributed keys. McGeehan will give a talk at Facebook’s upcoming F8 developer conference before starting his new role at Coinbase in April. Correction: McGeehan is not speaking at F8 later this spring. He has some experience from the banking industry as well after a stint at the Federal Reserve Bank of Chicago. Given how long the security man has been at Facebook — he directly thanks two of Facebook’s co-founders, Zuckerberg, and Moskovitz, in his post — the risk he’ll pick up by joining another young company isn’t likely too much of a scare. Bitcoin needs to mature, and for that to happen, its network members must do the same. Let’s hope McGeehan can keep Coinbase safe.